It's certainly one of his best works and it is housed in the church of San Pietro in Vincoli in Rome. 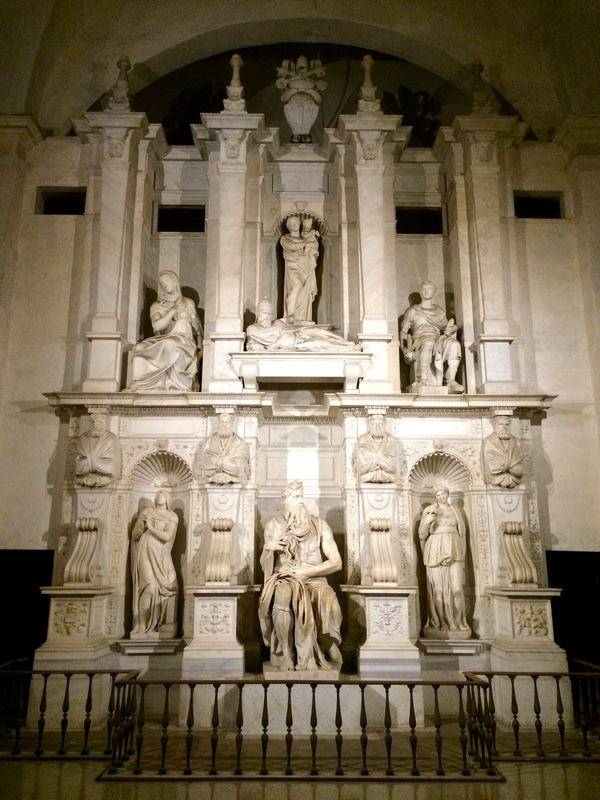 In 1505, Pope Julius II gave to Michelangelo the commission to design and sculpt his tomb. The initial design was massive and called for over 40 statues, showing various figures creating a dynamic space and a true statement on the importance of Julius. The project, however, was interrupted many times and, after the death of the Pope, the scale of the tomb was greatly reduced and Michelangelo made only one figure for the tomb, Moses. He is shown as seated, holding stone tablets containing the Ten Commandments from God. His body faces forward. His head with its mighty beard looks to the left. His right foot rests on the ground and his left leg is raised so that only the toes touch the ground. The facial expression of Moses is characterised as showing a mixture of wrath, pain, and contempt. Once finished the statue, it seemed so real and alive that Michelangelo violently hit the knee of the statue with a hammer, shouting, "Why don't you speak to me?" Michelangelo’s Moses is depicted with horns on his head. This is believed to be because of the mistranslation of the Hebrew Scriptures into Latin by St Jerome. Moses is actually described as having "rays of the skin of his face", which Jerome in the Vulgate had translated as "horns". The mistake in translation is possible because the word "keren" in the Hebrew language can mean either "radiated (light)" or "grew horns". From Hotel San Francesco you can take the bus no 75 that in about 20 minutes arrives at the church of San Pietro in Vincoli, where you can find the Moses. Built in the early sixteenth century at the behest of Agostino Chigi, rich banker from Siena, the Villa Farnesina in Rome, the Accademia Nazionale dei Lincei properties, it is one of the most noble and harmonious achievements of the Italian Renaissance. Palazzo Spada is an impressive building built in 1550 by Cardinal Capo di Ferro, later restored by Bernini and Borromini who created a unique full play of perspectives in a columns-gallery. The Moses by Michelangelo is certainly one of his best works and it is housed in the church of San Pietro in Vincoli in Rome. There is no other place like this in Rome. When you get through the gate for the first time, a peacefulness atmosphere surround you. Men from all over the world, rest together, under pine and cypress trees. The cemetery population is incredible rich in writers, painters and poets as Keats and Shelley. Only the genius of Bernini could make the hard marble look as soft as the human skin. Appian Way: A timeless walk, far from the crowded centre.